In this article, we will explain how to determine the required size of a septic tank. The typical residential septic tank size required for a given average daily sewage wastewater flow in gallons is provided in a table of septic tank sizes. 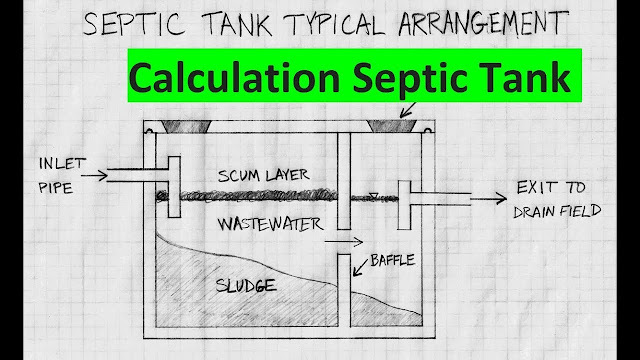 This article also explains how to calculate septic tank volume based on a septic tank inside dimensions measured in feet. 3.14 x radius squared x depth (all in feet) = cubic capacity. Cubic capacity x 7.5 = gallons capacity. gallons, 160 / .1337 = 1196 – or about a 1200-gallon tank. which we round up to 7.5 gallons/cubic foot. Very much informative and helpful to me.